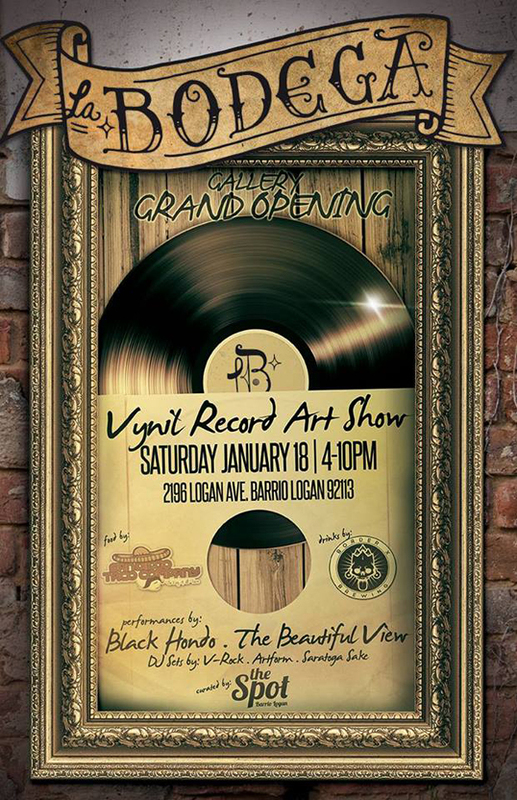 "Past" Vinyl Record Group Exhibit at La Bodega Studios & Gallery in San Diego, Ca. “La Bodega Studios & Gallery” is a new creative space located in the heart of Barrio Logan . The mission of La Bodega is to create a place that will inspire both struggling and established artists, as well as bringing the community together to understand the extraordinary role art plays in everyday life. Over 50+ of San Diego’s most talented artists will be participating. Each artist will use a 12″ vinyl record/album as their medium. There will also be Live Music, DJ’s, Street Tacos, and More!!!! Kristel Anne, Kargawd, Ricardo Islas, Cesar Castaneda, Carrie Anne Hudson, Libre Gutierrez, Ez Rock, Terry Gillard, Marisol De Las Casas, Saratoga Sake, Bat Brain, Thomas Maher, Anselmo Juan, Keemowerks, Jorge Piña, Elizabeth Piña, Maxx Moses, E.VIL, Karla Magana, Saira Soulrebl, Letitia Rogers, Paul Brogden, Juan Zavala, Linda Halsey, Hill Young, Carly Ealey, Andres Sarabia, Robert Piper, Jaime Garcia, Junk & PO, Roberto Rios, Monty Montgomery, Steven Suiter, Bret Barrett, Sekoh One, Paul Vargas, Jen Fong, Karen Ramirez, Erik Martin, David Reyes, German Corrales, Waist Knot Want Not, Optimus Volts, Rebel One, N.O.M.A.D., Eric Wixon, Roma Sanchez, Kelly Orange, Mario Chacon, Sho Love, Mario Torero, Matt Land, Ugo Villegas, Mex Art, Jorge Gutierrez, Jimmy Ovadia, Victor Villa, Sonia Lopez-Chavez, Lady Savage, Joe Tejeda, Kiki Platas, Joaquin Junco Jr., Unique, Abbazzabba Coltrane, Andre Powers, Kristyan Stjerne, Chikle, Revolucion Cultural, David “Gane” Feucht, Mayra Navarro, Selina Calvo, David Smith, Guillermo Valenzuela, Marcela Mihaloglou, Corina Coco Miller, Sarah Jane, Hector Villegas, Jennifer Lee Rojas, Sinners Brand, Marina Lorenzana, Miguel Angel Godoy, Ana Brown, Patricia Aguayo, Alexa Mangrum, Pixie Lopez Guzman, Pamela Jaeger.